Viazen Liver Detox, a powerful synergy of active medicinal ingredients. The ingredients’ synergy of Viazen Liver-Detox is the key of the effectiveness of this SUPERIOR FORMULA. Viazen Liver-Detox is a natural hepatic cure with added value. The goal of this formula is to insure an optimal detoxification process. This plant extract standardized in silymarin is known for its hepatoprotective and hepatoregenarative actions. Silymarin treats liver intoxication, promotes hepatocytes regeneration and improves antioxidant capacity of the liver. In addition, this medicinal herb reduces the cholesterol and blood triglycerides. It also owns anticarcinogenic properties. This plant extract offers a stimulating action on hepatobiliary and urinary functions. It helps the excretion of metabolites issued from detoxification, via the bile and urine. This antioxidant provides antioxidant protection in a large variety of physiological conditions. Indeed, the ALA has the advantage of being soluble in water (water soluble) and in fats (fat soluble), allowing neutralization of many types of free radicals. This plant extract is also involved in hepatobiliary and urinary regulation. In addition, it has a hepatoprotective effect against a variety of toxic components. This super food increases the quality of the formula by its content in indoles and isothiocynates. These bioactive molecules possess anticancer properties. They metabolize carcinogenic substances in molecules most polar (water soluble), and make them easier to be excreted without causing cell damage. This lipotropic factor helps to control hepatocytes activities, and in addition participates in the management of blood lipid molecules. This trace element has an important function, since it is a cofactor for more than 100 different enzymes necessary to metabolism regulation. It contributes to the maintenance of the integrity of cell membranes, and it allows activation of cytosol SOD. * Daily dosage corresponding to 2 capsules of Viazen Foie-Detox. Microcrystalline cellulose, vegetable magnesium stearate, gelatine. Viazen Foie-Detox is free of wheat, soya, corn, yeast, peanut, gluten, egg and dairy products. It does not contain preservatives, sweeteners, colouring agents, artificial flavours and is exempt of GMO. 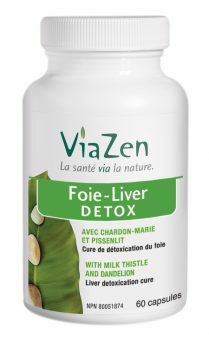 Viazen Foie-Detox will be taken as a cure, to support liver functions. The dosage is 2 capsules daily with food, for a minimum period of three consecutive weeks. The benefits will begin to be felt after a few days of use, but the optimal results will appear after three weeks of treatment. Ingest Viazen Foie-Detox a few hours before or after taking other medication. Consult a health care practitioner if symptoms persist or worsen and prior to use if you are pregnant or breastfeeding. Consult a health care practitioner if you have gallstones, liver or gallbladder diseases. Consult a health care practitioner if you have an intestinal obstruction. Consult a health care practitioner if you have diabetes or if you are taking blood thinners. Do not use if you are allergic to the Asteraceae family plants. Hypersensitivity, such as allergy, has been known to occur; in which case, stop the use. Liver intoxication occurs when the body, and more specifically the liver, is unable to effectively transform undesirable substances, so that they cannot be eliminated from the body. – Wheat grass juice cures. Exotoxines (xenobiotique), or chemicals from the environment, which include pesticides (insecticides, herbicides), industrial products and their derivatives (solvents and detergents), heavy metals (mercury, lead, cadmium, aluminum, etc. ), plastics (phthalates), insulating materials (asbestos), synthetic drugs, food additives, cosmetics, alcohol, etc. Endotoxins that come mostly from our own metabolic processes (ex: hormones breakdown, lactic acid production, etc. ), but they are also derived from the metabolism of the colonic bacterial flora. How is realized the liver detoxification ? The lipid solubility of the majority of xenobiotics allows them to be absorbed easily, penetrate fat cells and to get accumulated. The objective of the liver detoxification is to transform these lipophilic toxic substances into soluble compounds (water soluble), so that they are easily disposed off SAFELY by urinary tract and bile. This process involves multiple biotransformation enzymes, found in liver cells. The phase I, also called the stage of FUNCTIONALIZATION, uses oxygen to form intermediate compounds, highly reactive, and potentially dangerous. Then comes the phase II, named the CONJUGAISON, which allows neutralization of active compounds, making them harmless, so they are then excreted. Azneimittelforschung, 2000 ; 50 :260-265. Buchman AL et al. Choline deficiency causes reversible hepatic abnormalities in patients receiving parenteral nutrition: proof of a human choline requirement: a placebo-controlled trial. JPEN J Parenter Enteral Nutr. 2001 Sep-Oct;25(5):260-8. H. Fallah Huseini et al. The efficacy of Silybum marianum (L.) Gaertn. (silymarin) in the treatment of type II diabetes: a randomized, double-blind, placebo-controlled, clinical trial. Phytotherapy Research. Volume 20, Issue 12, pages 1036–1039, December 2006. Murashima M et al. Phase 1 study of multiple biomarkers for metabolism and oxidative stress after one-week intake of broccoli sprouts. 2004;22(1-4):271-5. Notes de cours : Pathologie Dynamique. IRRSN. Roseline Gagnon. 2006. Rooney JP. The role of thiols, dithiols, nutritional factors and interacting ligands in the toxicology of mercury. Toxicology. 2007 May 20;234(3):145-56. Epub 2007 Mar 1. Zembron-Lacny A et al. The comparison of antioxidant and hematological properties of N-acetylcysteine and alpha-lipoic acid in physically active males. Physiol Res. 2009;58(6):855-61. Epub 2008 Dec 17.